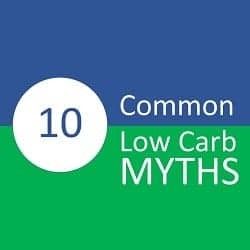 I keep coming across the same misconceptions about a “low carb diet” in online articles and on social media, so I decided to write an article dispelling the 10 most common myths. A recent study published at the end of March 2018 in Nutrients looked at health and nutrition data from 158 countries worldwide and found that total fat and animal fat consumption were least associated with the risk of cardiovascular disease, so even if someone following a low carb diet chose to eat foods high in saturated fat, it does not mean they are necessarily at higher risk of heart attacks or strokes. In a very low carb (ketogenic) diet used for epilepsy, the diet is mostly fat, however in a low carb diet used for weight loss and improving metabolic conditions such as Type 2 Diabetes or high blood pressure, the amount of protein will be moderate. According to Dr. Donald Layman, Professor Emeritus of Human Nutrition from the University of Illinois, a high protein diet doesn’t start “until well above 170 g / day”. Everybody’s needs for protein is different and many people, especially adults and older adults are either not getting enough protein or it is mostly at dinner, with little at breakfast and lunch, which is a concern in older adults, as it puts them at risk for sarcopenia, the muscle wasting often seen in older adults eating a Westernized diet. This does not mean that low carb diets contain no carbohydrate! As mentioned above, some liberal low carb diets have enough carbohydrate such that the person does not go into ketosis, while therapeutic ketogenic diets (done under medical supervision) such as those used for the management of epilepsy or as an adjunct to cancer treatment may have < 30 g of carbohydrate. There is almost no recipe that can’t be easily adapted for those that choose to eat low carb because food should not only be healthy, but enjoyable. There is a wide range of low-carb diets with various levels of carbohydrate, protein and fat. Some are high in meat, others low in meat, while others have no meat at all. Some are very high in protein and others are very high in fat. Some promote weight loss, others make it very difficult. There are different types of low carb diets because they are used for different purposes.